I remember when I first heard Baruch Levine’s Vezakeini. I found it on Youtube and listened over and over. I was a very broke college student at the time, but since I couldn’t put the video on my iPod, I finally bought the CD. It was great. I bought his next CD, Chasan HaTorah, which had already been out for a while. Not long after, Touched By A Niggun came out. Still being broke, I figured that two CDs by the same artist in less than a year was more than enough. But then I listened to the sample and soon became the owner of three Baruch Levine CDs. Needless to say, I was thrilled when I heard that a fourth album was released. So now comes the big question: how does Hashkifah compare to Vezakeini, Chasan HaTorah, and Touched By A Niggun? Well, first of all, I don’t think it makes sense to compare it to Touched By A Niggun just because that album is so different than the other three. I can’t say if this album is better or worse than any others—sorry. 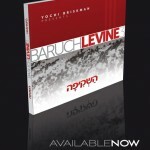 If you like the other Baruch Levine albums, you are guaranteed to like this one. That’s not to say it doesn’t have its differences. First of all, it seems to have much less child soloists/kids that the other albums. There are three songs that have very short appearances by a child soloist. I really enjoyed the soloists in the first three albums and the choir in Chasan HaTorah, so I do wish that the soloists were featured a little more on Hashkifah. Also, I feel like the fast songs have gotten better over time. On Hashkifah, I like them better than the ones on Chasan HaTorah, and I like those better than on Vezakeini. Baruch Levine has the most beautiful slow songs. You can tell that they are really sung with love and have a delicate feel to them. I think, of all the CDs I have or have heard, he is the only artist whose slow songs I enjoy better than his fast songs (as I mention in basically every review I do, I generally much prefer fast songs.) And this album has some absolutely stunning ones. For the first time, the opening track is a slow song. While the album is full of choirs (of men, not kids), this song is virtually all Baruch Levine until around 4:30. All the accompaniment is great, but it’s not something that he needs. He does a lot of great harmonies with himself. Of the slow songs, this is not my favorite. It has a lot of competition. It seems a little too long. And now we pick up the tempo. This song has a different feel (not sure how to describe it, it’s funky in a good way), and I love the way the singing starts out soft and then the whole choir comes in. Baruch Levine is one of the few artists that has songs with a fast tempo and electric guitars but still feels laid back and light in a way. It’s not “headachey”. This might be the slow hit of the album—it’s beautiful. The lyrics, from Mishlei, are a message from a father to his child. At 3:16, Dovid Dachs (Shalsheles Jr.) responds “Avi, avi, lo alech lo alech” to the “Bni, bni al telech al telech”. Dovid is great and I’m glad we get to hear him again. I don’t know what else to say, except this song is amazing. Listen at 3:38 for really nice harmonies. This song has more of the feel of the older Baruch Levine fast songs (but I think better than the old ones). I like the lyrics—something I had never heard before since it’s from Zohar, and I had no idea what it was saying until I read the booklet. It’s saying that Israel, the Torah, and Hashem are three intertwined knots. This is a catchy and fun song. This is by far my favorite song on the album and definitely one of my favorite Baruch Levine songs in general. It’s medium tempo, which means it has that soft, pretty feel with the music and also with Levine’s singing having the extra emotion. At the same time, it has an upbeat feel since it isn’t too slow. It also has a little bit of English lyrics mixed in (not a story, just a “Trust in Hashem, have faith in Hashem…” sort of thing), and I always love the mix.Child soloist Dovid Ginsburg makes an appearance here, and since he happens to be particularly good, it’s another big plus in the song. I really could listen to this song over and over and think it feels too short even though it’s the longest song at 6:17. I will be shocked if this doesn’t become a hit. The lyrics are something everyone can relate to and understand, though they aren’t overused. I really love everything about this song. A fun, upbeat song– but after listening to the album as a whole, not very memorable and doesn’t stand out. Here comes another beautiful slow song with the signature gentleness and Ahavas Hashem that Baruch Levine shows in his songs over and over. I love the harmonies throughout, and the “la las” around 3:45. The best part though has to be at 4:26. The song really steps it up a notch with the harmonies and big notes… The whole song is good, but 4:26 on is amazing. For now, this is my favorite fast song and probably the most catchy. It’s great to sing along and perfect driving music (or subway music, for those of us who take the train during rush hour like myself). The tempo is very fast– music and vocals alike– but once again manages to avoid any “headachey-ness”. It’s, by a big jump, the shortest song on the album, so be ready to hit repeat. I was a little confused by this introduction. The beginning of the song is full of big horns, and the lyrics mention “triumphant trumpet blasts”, so I understand that. But I thought this was going to be a big fast song and it is very soft and slow. Other than that, a really pretty song, though I think Mo Ashiv and B’Ni take the cake here. Watch for another appearance by the child soloist, Dovid Ginsberg. Great job, and I like how he is sings with the harmonies instead of all alone. Wow, there are a lot of lyrics in this one! It’s a good thing, because many Jewish songs today are no more than 5 words– if we’re lucky 20- repeating over and over. That being said, it makes it harder to get into than some of the others because it is inevitably less catchy in a way regardless of the tune. I can’t sing along! But, that being said, this is a really good song. It seems very complete, for lack of a better word with the all the changeups– the chazanus towards the end followed by the tempo increasing for example. We saw this song on Shwekey’s Live In Caesaria II, which I reviewed. It’s a beautiful slow song. It’s so full of heart that I feel like it might be attached to a personal story. I love his voice, but part of me wishes that it had stayed a Levine-Shwekey song. They always sound great together. I love this song, but it’s not new. The final verdict? I really do feel comfortable recommending this album to anyone (anyone who likes Jewish music, at least). It is full of beautiful compositions and so much heart. I am about to buy it as a gift for the second time (the first person loved it). Baruch Levine has once again made an album full of amazing songs, all of which are very good and many of which are great. Enjoy.